Hayrides make for a great way to spend part of a crisp, fall day. Photo by: Ben Grey via Flickr. Get back to basics this fall by hopping on a hayride at your local farm! 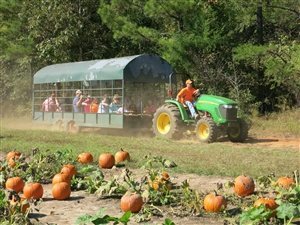 Hayrides are a traditional, family-friendly activity to participate in during the festive harvest season that attracts members of the community as well as city-dwellers looking to take a break from the hustle and bustle of city life. Hayrides at various farms can also be done quite differently from one another and in a variety of ways so be sure to check out more than one hayride if given the opportunity to do so this fall season. Do some research about the different hayrides close by! All hayrides are not the same! Some hayrides are pulled along with horses, some with tractors and others with trucks. Figure out which type of ride you’d prefer before heading over to your local farm for a leisurely ride. Wear something comfortable, and durable! While taking a ride through a pumpkin patch or across open farm landscape perched up on hay bales, you’re going to want to be comfortable and in something durable like jeans so that any hay that sticks out doesn’t poke through your clothing or irritate your skin. Also, be sure to wear something that you don’t mind if it gets a little dirty! Get there earlier in the season! The best way to hop on a hayride in a timely fashion is to get to the farms earlier in the season! Generally, the longer you wait in the season the more people there will be vying for your spot on the wagon. The looming presence of the end of the season really makes people kick it into gear when it comes to getting in last minute fall fun! Bring the whole family along! When it comes to seasonal fun that is fit for everyone, hayrides fit the bill to a tee! Kids will love experiencing this entertaining form of transportation, adults will enjoy the change of pace, and teens won’t be able to pass up on this exclusively fall activity with their friends or significant others. What's your favorite way to enjoy Hayrides during the Fall Season? Let us know by commenting below!